In 2006, author Patricia Sexton set out on a journey most of us have only fantasized about. She quit her job to pursue her dream. Thirty years old and a rising star at a Wall Street investment bank, Patricia wanted nothing more than to work as a foreign correspondent. So, that's just what she did, moving to Mongolia after landing an internship at the country's national TV station. 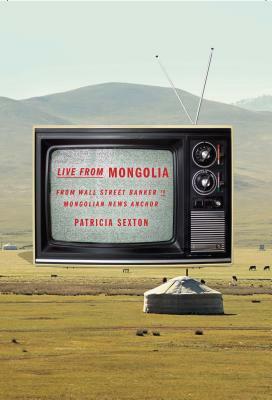 Live from Mongolia follows Patricia's unlikely journey from Wall Street to Ulan Bator. Not only does Patricia manage to get promoted to anchor of the Mongolian news, she also meets some unusual people following unusual dreams of their own. There's the Mongolian hip-hop star who worked in London restaurants to make his dream come true or the French corporate exec now tracking endangered horses in the steppe. All this whilePatricia is living with Mongolian Mormons, camping with nomads in the Gobi desert, and even crashing Genghis Khan's 800th anniversary party. But of course Patricia has her fair share of stumbles, including a brief return to Wall Street--even after meeting with the president of CNN. Live from Mongolia is the story of this ongoing journey--from a corporate career to a dream job Patricia hadn't even imagined she would land. After nearly a decade in banking, Patricia Sexton decided to pursue her life's dream to work in television as a foreign correspondent. She moved to Mongolia and anchored the English News. Patricia is the host of Sinovision's WE Talk, a talk show profiling people who pursue their passion. She has worked for CBS News, Britain's International Life, and she writes LIVE from Mongolia!, a weekly blog about people who follow their dreams. Along with her Director, she founded Morpheus Pictures, a production company dedicated to telling stories of people living passionate lives in the most far-flung places in the world. Patricia lives with her husband and daughter - commuting from their new home in New Zealand to her old home in New York City.